Our research into the protection of important sites has revealed that the Department of Environment’s (DoE) funding for restoration projects has fallen from over £4.4million in 2014/15 to zero for the current financial year – although £500,000 was made available through the government’s plastic bag levy fund. Also, more than 650 buildings that were previously listed have lost their protected status, while it has emerged that the government’s rolling survey of historic buildings has been radically scaled back as a result of cuts. The Department’s role in enforcement also comes under scrutiny today, with just 60 Urgent Works Letters issued in respect of buildings that have fallen into a state of disrepair in the past five years. Conservation groups, responding to the findings, criticised the government’s performance and argued that for every pound invested in historic buildings, a return of nearly £8 can be identified. Expert in the field Rita Harkin said: “The Department has completely lost sight of the need, during recessions especially, to grow the construction industry which needs a shot in the arm. The department should be looking at how it can maximise the potential of these assets." In a further development, fires at historic buildings continue to be a regular occurrence, despite a series of Heritage Crime Summits in 2011 and 2012. Detail Data can reveal that 12 fires have been recorded by DoE in the four years after the first summit, with a number of incidents – including fires at Crumlin Road Courthouse in Belfast and the former Downe Hospital in Downpatrick - not being officially recorded, despite considerable media coverage. Conservation groups have called on community and voluntary groups – such as building preservation trusts - to challenge government and their local councils to prioritise investment in suitable restoration schemes, while making greater use of existing enforcement powers. It is also revealed that the Built Heritage at Risk register, which contains details of 496 vulnerable structures, has been unavailable to view on the DoE website for nearly a year. However, in the process of our research the Department confirmed it will be updated and published online within weeks. Detail Data also looked at the stories behind some of the historic buildings that are at risk, buildings that have been restored, or sites that have been delisted. According to advocates, the funding of restoration schemes can benefit the economy and society. In terms of success stories, Built Heritage Adviser Rita Harkin said that St George’s Market could have been demolished but was now a “jewel in the crown” of Belfast and the transformation of a former at risk bank building into the five star Merchant Hotel was also “a fantastic example of commerce and conservation coming together and making a real difference to business and the wider area”. The protection of historic buildings can be costly for owners, while renovations can also be expensive, with costs rising if sites suffer damage through vandalism or weather conditions. As such, the maintenance of Northern Ireland’s stock of roughly 8,500 listed buildings relies heavily on grant aid. Figures provided to Detail Data by the DoE following a Freedom of Information request, showed that its Listed Buildings Grants have directed £33,115,448 towards 1,245 projects since 2005. This funding has helped restore buildings for use as homes, social enterprises, business and leisure attractions. Details of which projects received grant funding are available to view here. However, funding cuts meant the DoE did not allocate a budget to the listed building grant scheme in the current financial year. For Ms Harkin, this means opportunities will be lost. “The leverage (from the grant) is enormous. We have seen £1 of grant levering almost £8 from other sources which is a really good rate compared to any other public funding,” she said. “I think the department has completely lost sight of the need, during recessions especially, to pump prime, grow the construction industry which needs a shot in the arm. “I think we need to rethink this terminology of Buildings at Risk. These are buildings with potential and that potential needs to be harnessed. "The grant aid scheme was designed to help meet the recognised additional costs of repair and maintenance of listed buildings. "In its absence it is inevitable that, in many cases, these essential works will not take place. Special buildings, worthy of protection in the public interest, are bound to become increasingly 'at risk'." Detail Data understands that at the beginning of 2015, there were 203 pending grant applications with the Northern Ireland Environment Agency, 59 of which related to at risk buildings. With restoration funding severely curtailed, securing funding for such schemes is proving difficult. To view DoE's responses to our questions click here . The future of 496 historic structures, including castles, terraces, railway stations, churches and mills is at risk. The Department of Environment (DoE) deems these buildings, which are listed on the Built Heritage at Risk register (BHARNI), to be “under threat from neglect, ignorance or future development”. Despite funding the compilation of BHARNI, the register has not been available to view on the DoE website for nearly a year, with Detail Data obtaining a copy of the August 2015 version of the register from the Ulster Architectural Historical Society (UAHS) who maintain it on the department’s behalf. To view the BHARNI database on our datastore click here. When asked why the register was no longer available to view, the DoE said that an updated version will be online within four weeks. According to Ulster Architectural Heritage Society (UAHS) chief executive Nikki McVeigh, the register plays a crucial role in finding a new future for at risk buildings. “It is incredibly important as these are the most vulnerable buildings that we have on the listed buildings database,” she said. “In terms of BHARNI, there has been a period of time where it hasn’t been fully available online. The register provided to Detail Data shows that 61 buildings have been given the most severe ‘critical risk’ rating while a further 274 buildings are at a ‘high’ level of risk. However, it shows more than just deteriorating buildings. It provides a snapshot of shifting demographics, changing industries and a changing way of life. Click here to read buildings case studies. Although homes are the most common type of building on the list (over 200), there is perhaps greater significance in some of the smaller numbers. For example, 20 churches are listed – something that hints at demographic change and the decline of religious practice. The number of mills (18) is evidence of changes in industry, while the presence of tram, rail and canal structures provide evidence of older transport infrastructure. The presence of 10 country houses also shows the decline of the historic landlord system, while technological development has effectively made structures such as ice houses redundant. Although the majority of buildings registered as being at risk are privately owned (262/496), a surprising number are recorded as being owned by state organisations. Central government (6), local government/council (15), health boards (4), education boards (6) and police (1) are recorded as owners, while the main Christian churches (29) also appear prominently. The ownership of 42 buildings is also listed as being unknown. However, many of these ‘unknown’ structures are religious in nature – with old churches and graveyards present. Although the overwhelming majority of structures are recorded as being vacant (393), 41 are listed as having some form of occupancy, while one is still fully occupied. The DoE has a 10 year target of saving 200 buildings which are on the BHARNI register by 2016. This is a target that is likely to be met, with 185 buildings having been restored since April 1, 2006. It is understood that a number of recently completed, ongoing and announced schemes will take some buildings off the current BHARNI list. These include Drumbee old schoolhouse (Armagh), Ardglass bath house, the former Methodist Church on Belfast’s University Avenue, the former Bank of Ireland on Royal Avenue and Killeavy Castle outside Newry. 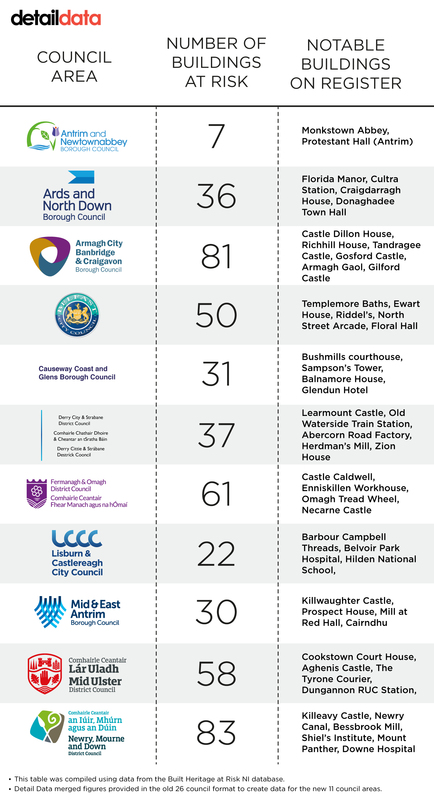 The number of Buildings at Risk in each of the 11 new council areas. Hearth Housing is a housing association that prioritises the reuse of historic buildings. It played a key role in the restoration of 19th century terraces at McMaster Street in east Belfast, as well as in dozens of other projects. Hearth director Marcus Patton said any perception that historic buildings are the preserve of the wealthy is misplaced. This is a philosophy Ms Harkin would like to see adopted on a more widespread basis. “Red brick terracing in working class areas are what I am particularly focussed on now. They have been massively eroded over time and you lose close knit communities and all the social benefits that come with that as well,” she said. With planning powers being transferred to the 11 new councils and major changes to the structure of Stormont’s departments being implemented in the coming months, Ulster Architectural Heritage Society chief executive Nikki McVeigh believes further challenges are looming. “We are in a period of unprecedented change,” she said. “Previously the Department of Environment was the lead in terms of protection, but now it has passed to a number of different parties. Planning has been passed out to council level and therefore the 11 councils have a big responsibility to look after their historic buildings. Councils also now have responsibility for issuing Urgent Works Letters and Notices to owners of buildings falling into poor condition. Ms McVeigh said that there is already evidence of a difference in approach to built heritage in the 11 new councils. “There have been different responses to these new powers. Some take a very much heritage led approach due to the heritage that already exists within their area and the instilled pride in it. Rita Harkin believes that in such areas the public have to make their voices heard. “The community and voluntary sector have to make the case to government,” she said. A total of 653 historic buildings have been ‘delisted’ over the past 20 years. This includes more than 300 houses, over 70 shops, 54 churches, 40 bridges and 19 public houses. The Department said delisting occurs if information collected in a second survey of previously listed buildings fails to meet criteria that was revised and updated after public consultation in 2011. This is often the result of unapproved alterations. However other factors can present difficulties for owners such as approved alterations later found to be inappropriate, the impact of vandalism and weathering can play a part in this process. Figures secured by Detail Data from the Department of Environment under the Freedom of Information act show delisting has occurred in all 11 of the new council districts. The remainder (27), were contained in DoE media releases which were published after the release of the FOI data. To view details of all delisted buildings click here. Of the 11 council areas, Newry, Mourne and Down has seen the most buildings delisted, with 133 losing their protected status. At the other end of the scale, Fermanagh and Omagh council area has had just 14 delistings, although this figure has the potential to rise upon the eventual completion of the second survey. According to the DoE: “Statutory listing of buildings began in Northern Ireland in 1974 and the first survey took over 20 years to complete”. This provides a level of formal protection for “buildings of special architectural or historic interest”. Listed status limits the type of alterations owners can make and allows the Department to take enforcement action against individuals who do not protect the integrity of a protected structure. 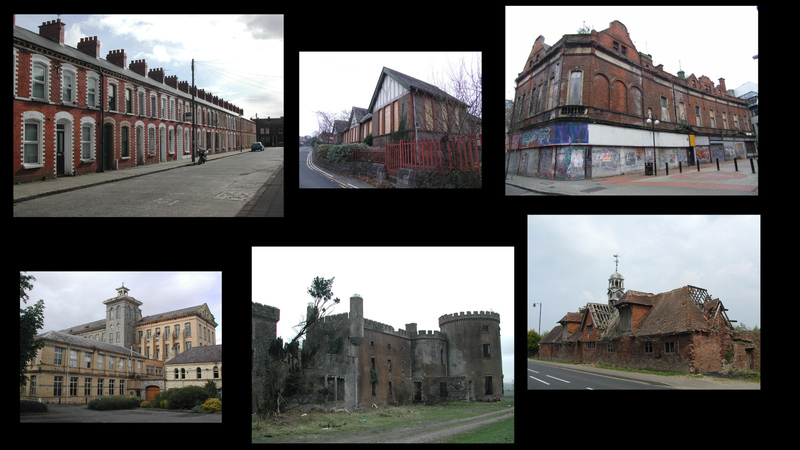 Given the limited nature of the initial survey of buildings, in 1997 a second survey was initiated, with more than 60% of Northern Ireland’s near 8,500 listed buildings already re-evaluated to provide more in depth records. In addition to delistings, a considerable number of buildings have also been listed for the first time as part of the process. Until recently the Second Survey had been carried out by an external contractor. However, due to recent budget cuts, the DoE is now operating a scaled back, in-house, version of the process, meaning that the original 2020 completion date looks unlikely to be met. The DoE said: “Given the significantly reduced budget for the Department for 2015-16, funds were not available to continue the contract let for the project and this was terminated in June. “Given the reduction in funding, and the reduction in civil service staffing through the voluntary exit scheme, all departments are having to make difficult decisions on priorities and allocation of resources. The type of property delisted varies considerably, with everything from homes, business premises, bridges, memorials, pubs and churches. It is also notable that some 34 already demolished buildings are formally recorded as being delisted. Marcus Patton of Hearth said: “You should never need to delist. “If someone does damage to a building they should be prosecuted. If you can’t prosecute, leave it on the books as being a building that should be like this, that is now like that and you can get grants to put it back. ALMOST 500 historic buildings across Northern Ireland are deemed to be at risk, with fears the number could rise after the removal of restoration funding. The Department of Environment’s funding for restoration projects fell from £4.4million in 2014/15 to zero for the current financial year – although £500,000 was provided through the administration’s plastic bag levy fund. The new Detail Data research into Stormont’s protection of historic sites also found 650 buildings have lost their protected listed status over the last 20 years. Campaigners claimed grant aid for restoring heritage buildings is shown to yield almost £8 for each £1 invested. Built Heritage adviser Rita Harkin said: “The Department has completely lost sight of the need, during recessions especially, to grow the construction industry which needs a shot in the arm. “The grant aid scheme was designed to help meet the recognised additional costs of repair and maintenance of listed buildings. The Department of Environment (DoE) defended its record, citing pressures caused by budget cuts and the loss of staff due to the civil service voluntary exit scheme, but underlined that efforts were being made to ensure some funding was available. The condition of the 496 vulnerable structures - which include castles, mills, schools, terraces and towers - is recorded in the Built Heritage at Risk Register which was last year removed from the DoE website, but which the department said it hoped to reinstate. The buildings at greatest risk include the 18th century Mount Panther site in Clough, Co Down, plus Kilwaughter Castle in Larne, Co Antrim. To date, just one at-risk building, Sion Stables in the Co Tyrone village of Sion Mills, has been the subject of a DoE led compulsory purchase. It represents a restoration success story, with the fully restored building now transformed into a local heritage centre and cafe. The department’s role in enforcement has also come under scrutiny, with just 60 Urgent Works Letters issued in respect of buildings that have fallen into a state of disrepair in the past five years. The research also confirms that fires at historic buildings continue to be a regular occurrence, despite a series of Heritage Crime Summits in 2011 and 2012. Conservation groups have called on community and voluntary organisations to challenge government and local councils to prioritise investment in suitable restoration schemes. This comes as local councils take on a greater role in enforcement, an outworking of the reduction in local authorities in Northern Ireland from 26 to 11 earlier this year.